What is Melbourne Spring Fashion Week (MSFW) without any films on the biggest names, trends and history of fashion? Thankfully the friends at the Australian Centre for the Moving Image (ACMI) have brought their 4th annual Fashion on Film collection to move the fashion firmament of Lionel's Melbourne beyond City Square, Emerging Designers, Exhibitions, the Business Series and the 4 Faces of MSFW. Donna Hillier of ACMI and I chatted about the must-see double feature of the Golden Eighties and Anti-Fashion curated by James Nolan. Donna explain that the best part about both features are the exclusive interviews with designers, models fashion editors, journalists, collaborators as well as 30 years of archival and brand new footage to thrill every fashionitas. 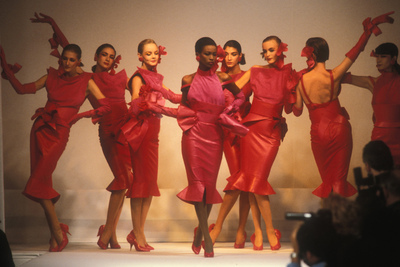 The eighties herald a new era of bold and extravagant fashion designs introduced by talents including Jean Paul Gaultier, Thierry Mugler , Claude Montana and Azzedine Alaia who rose to superstardom, changed the Paris-based fashion scene and brought the world's attention to the fashion capital. The excess of the eighties lead to the emergence of the 'anti-fashion' movement characterised by deconstructed and minimalist style championed by Japanese designers Yohji Yamamoto and Rei Kawakubo, 'Antwerp Six' which included Gaultier's protégé Martin Margiela and Ann Demeulemeester, Helmut Lang, Jil Sander, Raf Simons, Hussein Chalayan and, more recently by American Rick Owens. Their questioning of the eighties glamour paved the way for designs that changed fashion in the post-industrial world forever. With tickets at only AUD15, ACMI offers a moving picture of fashion that will coax the fashionitas out of you and add another layer of excitement to MSFW. Why? If you love fashion in the eighties and nineties with its range of bold and extravagant to its minimalistic, then you're in for a treat with ACMI's Fashion on Film on the Golden Eighties and Anti-Fashion.